One machine that makes four Belgian waffles in under 5 minutes? Sounds like good deal to me. Unfortunately, this VonShef Quad 4 slice Belgian Waffle Maker disappointed in a few important ways. At first glance, it looks like a machine that will get the job done, but let's take a closer look in this in-depth review. Four big Belgian waffle squares are hiding inside this black VonShef waffle maker. A nice stainless steel top is a contemporary contrast to the dark plastic on the outside. However, to get big waffles, you do get a pretty big machine so if you are short on kitchen space, make room for a 14.4 x 12.5 inch square. The metal cooking plates inside the VonShef waffle maker have a decent sized Belgian waffle grid- the squares aren't too thin but not too deep either…just right I think! The VonShef Quad 4 slice is a pretty straightforward machine with very few frills. Non stick plates and a red and green indicator light are all the 'extras' that this machine has. Skip the drip tray or temperature control because if you don't need lots of bells and whistles, why pay for them?! Running at about $30, the VonShef promises to make 4 Belgian waffles in just 5 minutes- perfect for breakfast in a hurry for a big family! All the facts about the VonShef Quad sound good but let's plug it in and make some waffles. Watch our video review and keep reading to see if this is the waffle maker for you. The VonShef Quad took about 5 minutes to heat up and when it was ready for batter, the green light on the machine went off. The waffle maker has a latch which keeps it closed and to open the VonShef, you simply press the top of the latch to release it. It took about 1 1/4 cups of our amazing waffle batter to fill all 4 Belgian waffle squares. I closed the waffle maker and the cooking began! The instruction manual said that the Belgian waffles would take about 4-5 minutes to cook so after 4 minutes, I went to open up the VonShef. As steam was pouring out of the machine (which is a good sign that the waffles are cooking! ), I had a hard time unlocking the latch as I had to reach through the hot steam to press the button. While the handle itself was not hot as VonShef promised by stating it is 'cool touch', the steam issue is a design flaw that is hard to get past - you don't want to be burned when trying to get to those delicious waffles (or maybe you need a pair of gloves). In my view, this is a serious reason not to buy. I used 1 1/4 cup of batter for the VonShef Quad 4 slice but the batter did overflow out of the machine slightly. A little less batter would probably work just fine. The waffles popped off of the plates cleanly and there was barely any clean up needed on the VonShef. The Belgian waffles were a very nice golden brown and while the edges of the waffles were slightly pale but the parts which browned were nice and crunchy. Tricky latch makes the machine hard to open. Steam pours out of machine while the waffles are cooking right by the handle and could easily burn your hand. The top metal surface of the machine gets pretty hot to the touch. The VonShef 4 Slice is a big machine- not very friendly for smaller kicthens. While the simplicity of this VonShef waffle maker is great (it does make four nice golden brown Belgian waffles quickly! ), I only give this waffle iron 3 stars. There were too many downsides to this machine to look past. The hot top surface and the steam hazard make it slightly dangerous to use- you don't want to be injured when trying to make your breakfast! It was also a very bulky machine especially when compared to other 4 slice machines (for example, check out my review on the Hamilton Beach 4 Slice Belgian Waffle Maker, which is much more compact). Still, if you're interested, you can see what other people are saying on Amazon. Maybe you really don't need to make 4 waffles at once and a big single waffle will do? What about two Belgian waffles in one machine? Or maybe you like the idea of cooking waffles over an open fire? 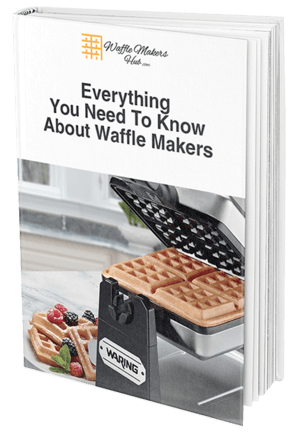 Check out our full buyers guide where we compare some of the best waffle makers of the year!